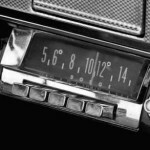 At the beginning of this era of doo wop music and rock and roll, roughly 1952, radio was still royal. This would change in decades to come, but at this point teens all across the forty-eight States and beyond would need to tune into their favorite stations in order to hear the most popular hits of the day. Records represented the only other real option for the young listener, but vinyl cost money and radio was free (unlike in Europe and other parts of the world, for instance, where simple home listening and TV viewing still requires a monthly fee). 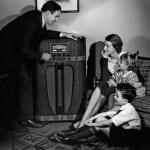 From the 1920s into the early 1950s, the radio played a more integral role in a family’s entertainment. It was a “piece of furniture” (Fig. 1 above in the top left corner) around which family members could gather to enjoy a variety of music and programs before television dominated the landscape. But with a growing post-war economy that, for the first time ever, put spending money into the hands of the younger generation—“teens,” as they would henceforth be categorized—radios became more personal-sized and affordable for the individual teen. And cars, which were becoming more and more accessible to the young, were veritable radios on wheels to listen to their doo wop groups and rock and roll music. Another available option for listening was the jukebox. The 1950s versions were imposing mechanisms with miles of chrome and multicolored lights (Fig. 4 above in the second row left). 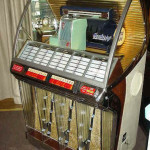 The listener could choose as many songs he or she wanted, filling the machine with the requisite coins per play (about 10¢ per song in 1955, three songs for a quarter). 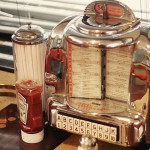 Later, tabletop jukeboxes populated diners (Fig. 5above in the second row center) and patrons could purchase plays right at their table while downing their cheeseburgers and milkshakes. These players were electronically connected to a master phonograph somewhere in the building, but if the diner was particularly crowded and numerous songs were being selected, one often left the establishment long before the chosen songs were played. Of course, music hit parades in the 1950s weren’t only determined by radio airplay. Record sales were the real arbiter of a song’s chart position, and teen record collections began to increase as the decade progressed. In the beginning, those records were thick, 10- or 12-inch breakable discs that turned at 78 revolutions per minute (rpm). These represented either one performance per side, or albums: a collection of songs on each side (The term album had come from the earlier tradition necessitating the breaking up recordings of long classical performances into multiple discs, and offering them collectively in an “album.” The term has continued to be used even when only referring to one disc—now a CD—containing multiple songs.) By the mid-50s, albums had evolved into 12-inch unbreakable discs, turning at 33 1/3 rpm, yet the teen audience was more interested in a more novel format: the single. At 7 inches, with a “single” song on each side and turning at 45rpm—hence the nickname “45s”—these smaller records were much more affordable than an album. 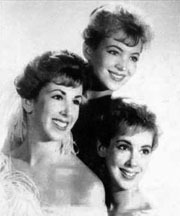 In this era of doo wop music and rock and roll, say 1955, an album could set back a teen’s piggy bank by $4 or $5, while a 45 cost a mere 89¢ and highlighted the hit song currently on the charts rather than another dozen or so “filler” songs that an album would include and which the buyer may not even want. All of this changed, however, with the advent of the 45-only record player (Fig. 9 above in the third row right). Generally irrelevant to the older crowd, this modestly budgeted player was tailor-made for teens whose record collections were primarily singles, which could stack and drop individual discs just like their parents’ dinosaur in the parlor. 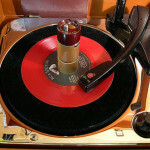 Later, reasonably-priced players with the ability to play all sizes and speeds of records (7, 10, and 12-inch; 33, 45, and 78rpm) were produced and proliferated. 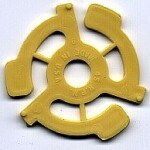 However, whether expensive living room hi-fi or bedroom 45 changer, vinyl records had their audio drawbacks. They easily damaged. Regardless of how much care was given to keeping them pristine, inevitably the listening experience was accompanied by the sounds of scratches, ticks, pops, and the notorious skip, where damage at a certain location in the grooves of record caused the stylus to “skip” back to a previous groove, treating the listener to an annoying, stuttering, repeat of that part of the song. What all of these records and players had in common, for parent as well as progeny, was that they were all monophonic. Before about 1957 stereo recordings were produced and available, but almost exclusively of classical music and primarily on reel-to-reel tape. (The owner of a stereo tape player/recorder of this sort was very rare and usually of sophisticated taste, since the overwhelming majority of stereo recordings was of classical music.) Also, until about 1967, the most popular music radio stations were of the AM frequency, which only broadcast in monophonic. Pop and rock and roll recordings in the late ‘50s did begin to be produced and released in the stereophonic format. This tradition of how we listened maintained throughout the 1960s with mono singles and albums and mono radio. 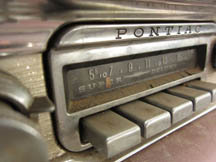 By the end of the decade, however, FM radio was making inroads through its ability to broadcast in stereo, and because of fewer commercial interruptions, longer pieces of music. As music earlier influenced technology, technology now influenced music, and pop recordings became more elaborate and more sonically inventive. The growing interest of the audience in these innovations saw them leaving AM radio’s simplicity for FM’s potential artistic complexities. Soon, records themselves, those stalwarts of the entire century to this point, gave way to tape—first eight track cartridges, then smaller cassettes. And as the music of that first generation of teens entered the world of nostalgia, so too did the technology through which that music had first been enjoyed. But only for so long. 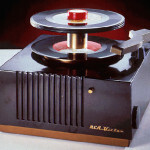 Records and record players, as it happens, have once again been surging in popularity amongst the young. 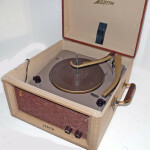 And so, despite the advances in producing pristine, clutter-free sound that have long been afforded the public, the chosen mode of listening by a select yet growing percentage of young people is again the vinyl record, with all its scratches, ticks, pops, and skips—and willingly at $25 an album! Of course, transistor radios became popular with teens as well. There were even earplugs, so the family did not have to hear the music along with them. If you would like to read more about the transistor radio, please click here. Robert Florczak was born in 1950 in Washington, D.C. He earned a Bachelor of Fine Arts degree from Cooper Union in New York City, studying painting under Will Barnet and photography under Gary Winogrand. Florczak was artist-In-residence at Widener University and taught painting at the Art Institute of Philadelphia, the Laguna College Of Art and Design, and the San Francisco Academy of Art University. Florczak’s art is characterized by an avid interest in historical, literary, and mythological themes of drama and romance, and an intimate understanding of the classical methods of the Old Masters. As a professional artist, he has had an active career spanning four decades, with extensive work in the fine art, advertising, entertainment, and publishing fields. His original works are in the private collections of Mel Gibson, Michael Jackson estate (including the logo of Neverland Ranch), Whoopi Goldberg, Jimmy Stewart (now at the James Stewart Theater at Princeton University), and Paul Allen (Microsoft’s co-founder), among others, and in corporate collections, including those of AT&T, Random House and Beecham Pharmaceuticals. That was it. Radio and then transistor radios. Record players, hi fi. The best music in the word is the 1950s music. Thanks for the article. Nicely done. Interesting. 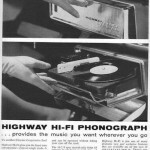 Yes, we had the radio, record players, and transistors. Wish I still had my 45s. 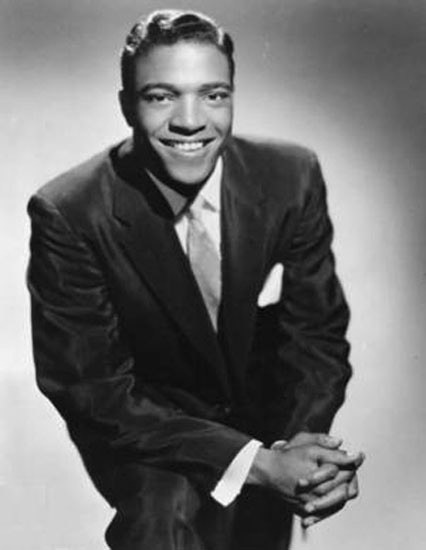 Love doo wop music and rock and roll.